Every DynaMarine boat is equipped with the best electronics money can buy. 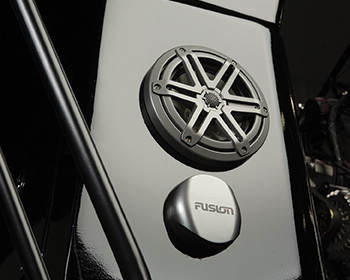 Premium Livorsi marine gauges monitor engine performance. Garmin navigation lets you chart your day’s course or call up a previous ride. Top of the line JL Audio and Clarion sound systems let you bring the party with you as you cruise the backwaters or chill on a river sandbar. Connect to your music source through a USB port, or wirelessly with Bluetooth, and listen to your favorite tunes. When the sun goes down you can switch on your Dyna’s ambient lighting for a relaxing evening mood. Night time running lights show you the way and keep you safe on the water. DynaMarine takes full advantage of today’s technology to provide the ultimate in control, convenience and comfort.